Police Officer Eldridge Cornelius was shot and killed while responding to a disturbance call. He was attempting to arrest two men at the scene when one of them produced a handgun and shot him in the abdomen. The suspect was convicted of murder and sentenced to death. His sentence was later commuted to life. He was released in 1940. Officer Cornelius was survived by his wife and five children. 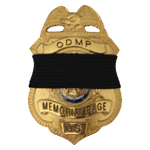 Rest in Peace Police Officer Eldrige C. Cornelius. Thank You for your Service and Sacrifice protecting the citizens of Simonton, Texas.